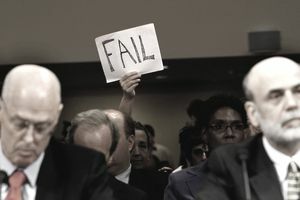 The investment banks Goldman Sachs and Morgan Stanley were also too big to fail. The Fed bailed them out by allowing them to become commercial banks. That meant they could borrow from the Fed's discount window. They could take advantage of the Fed's other guarantee programs intended for retail banks. That ended the era of investment banking made famous by the movie, "Wall Street." The 1980s mantra, "Greed is good," was now seen in its true colors. Wall Street greed led to taxpayer and homeowner pain. The Federal Reserve provided an $85 billion, two-year loan to AIG to further stress on the global economy. In return, the government received 79.9 percent of AIG's equity and the right to replace management. It also received veto power over all important decisions, including asset sales and payment of dividends. In October 2008, the Fed hired Edward Liddy as CEO and Chairman to manage the company.